Researchers using NASA's Mars Reconnaissance Orbiter (MRO) have found eight sites where thick deposits of ice beneath Mars' surface are exposed in faces of eroding slopes. These eight scarps, with slopes as steep as 55 degrees, reveal new information about the internal layered structure of previously detected underground ice sheets in Mars' middle latitudes. Researchers who located and studied the scarp sites with the High Resolution Imaging Science Experiment (HiRISE) camera and Compact Reconnaissance Imaging Spectrometer for Mars (CRISM) aboard MRO reported the findings Jan. 11 in the journal Science. The sites are in both northern and southern hemispheres of Mars, at latitudes from about 55 to 58 degrees, equivalent on Earth to Scotland or the tip of South America. "There is shallow ground ice under roughly a third of the Martian surface, which records the recent history of Mars," said the study's lead author, Colin Dundas of the U.S. Geological Survey's Astrogeology Science Center in Flagstaff, Arizona. "What we’ve seen here are cross-sections through the ice that give us a 3-D view with more detail than ever before." Michael Mellon, a co-author on the study from the Johns Hopkins Unversity Applied Physics Laboratory (APL) in Laurel, Maryland, said these scarps reveal that in at least some locations, these concentrated deposits of ice can be quite thick. "The amount of water stored in these deposits is more than is expected in just icy permafrost soils," he said. "The extent and relative purity of these deposits make them an excellent target and potential resource for future robotic and human exploration." 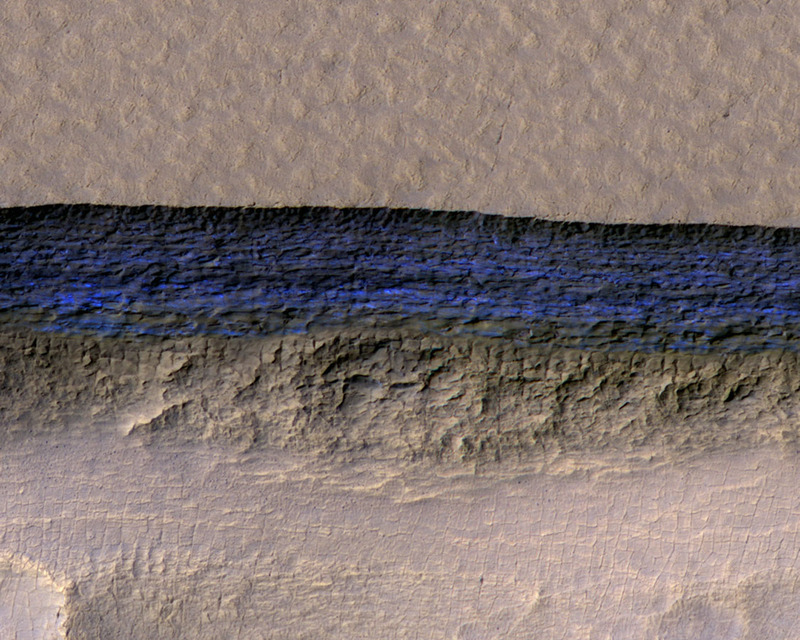 A cross-section of a thick sheet of underground ice is exposed at the steep slope (or scarp) that appears bright blue in this enhanced-color view from the High Resolution Imaging Science Experiment (HiRISE) camera on NASA's Mars Reconnaissance Orbiter. The view covers an area about 550 yards (500 meters) wide. North is toward the top. The upper third of the image shows level ground that is about 140 yards (130 meters) higher in elevation than the ground in the bottom third. In between, the scarp descends sharply, exposing about 260 vertical feet (80 vertical meters) of water ice. Color is exaggerated to make differences in surface materials easier to see. The presence of exposed water ice at this site was confirmed by observation with the same orbiter's Compact Reconnaissance Imaging Spectrometer for Mars (CRISM). Scientists have not determined how these particular scarps initially form. However, once the buried ice becomes exposed to Mars' atmosphere, a scarp likely grows wider and taller as it "retreats," due to sublimation of the ice directly from solid form into water vapor. At some of them, the exposed deposit of water ice is more than 100 yards, or meters, thick. Examination of some of the scarps with CRISM – which is able to discriminate water ice from other materials because water ice has a distinct spectral "fingerprint" in near infrared wavelengths beyond the range of visible light – confirmed that the bright material is indeed frozen water. "It’s like being able to see in hundreds of colors," said CRISM Science Operations Lead Kim Seelos, of APL. "This discovery directly confirms the long-held notion that there are extensive underground reservoirs of water ice. The fact that it is exposed directly on the surface is exciting both from a climatological perspective and as a potential resource for future human exploration." A check of the surface temperature using Odyssey's Thermal Emission Imaging System (THEMIS) camera helped researchers determine they're not seeing just thin frost covering the ground. Researchers previously used MRO's Shallow Radar (SHARAD) to map extensive underground water-ice sheets in middle latitudes of Mars and estimate that the top of the ice is less than about 10 yards beneath the ground surface. The new study not only suggests that underground water ice lies under a thin covering over wide areas, it also identifies eight sites where ice is directly accessible, at latitudes with less hostile conditions than at Mars' polar ice caps. "Astronauts could essentially just go there with a bucket and a shovel and get all the water they need," said co-author Shane Byrne of the University of Arizona Lunar and Planetary Laboratory, Tucson. The exposed ice also has scientific value because it preserves evidence about long-term patterns in Mars' climate. The tilt of Mars' axis of rotation varies much more than Earth's, over rhythms of millions of years. Today the two planets' tilts are about the same. When Mars tilts more, climate conditions may favor buildup of middle-latitude ice. The researchers say that banding and color variations apparent in some of the scarps suggest layers "possibly deposited with changes in the proportion of ice and dust under varying climate conditions." The full Science article, "Exposed subsurface ice sheets in the Martian mid-latitudes," is available to subscribers at http://science.sciencemag.org/content/359/6372/199.full. APL leads the CRISM investigation. The University of Arizona operates HiRISE, which was built by Ball Aerospace & Technologies Corp., Boulder, Colorado. JPL, a division of Caltech in Pasadena, California, manages the MRO and Odyssey projects for the NASA Science Mission Directorate in Washington. Lockheed Martin Space, Denver, built both orbiters and supports their operation.